Mridula Vinjamuri, M.D. 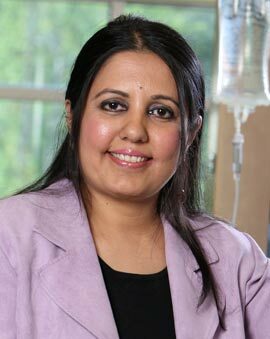 comes to Commonwealth Cancer Center from Nebraska Hematology and Oncology, after completing her fellowship in Hematology and Oncology at West Virginia University Hospital in Morgantown, West Virginia. Her residency was in Internal Medicine at Michigan State University’s Covenant Hospital in Saginaw, Michigan and her surgical residency was at Cornell University’s North Shore University Hospital in Manhasset, New York. Dr. Vinjamuri holds a Bachelor of Medicine and Surgery (MBBS) from A.P. State University of Health Sciences at Guntur Medical College. Dr. Vinjamuri has received numerous recognitions, honors, and awards in academics , research and clinical care over her career. Among distinctions is her listing by Consumers Research Council of America in “America’s Top Physicians,” as well as a notable grant awarded by The Health Care Foundation of New Jersey recognizing her excellence in research. She has given multiple case presentations in medical conferences across the United States and has authored dozens of abstracts and publications, including topics on PET scans in small cell lung cancer and chemotherapy of brain tumors. Dr. Vinjamuri lives in Corbin with her husband and two children. Dr. Vinjamuri has a full-time practice in Corbin and sees patients Monday through Friday.